Last month, Hoosier State Chronicles published a story on John T. McCutcheon and George Ade’s charity cartoons during World War I. In this post, we will be sharing another cartoonist’s work during the war. Hoosier cartoonist and author Kin Hubbard. 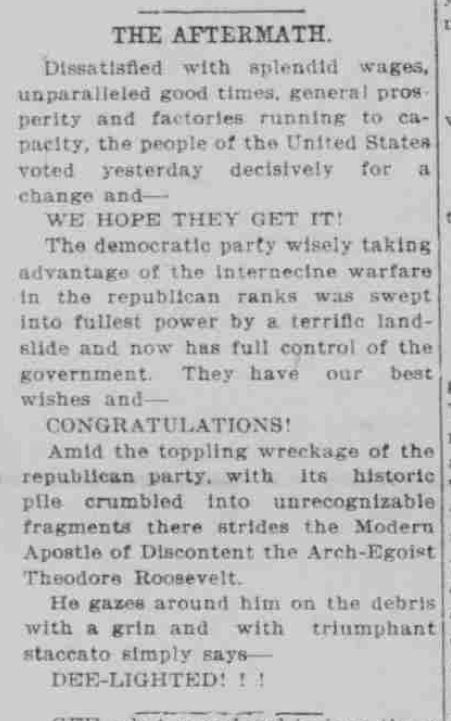 Indianapolis News, November 30, 1917, Hoosier State Chronicles. 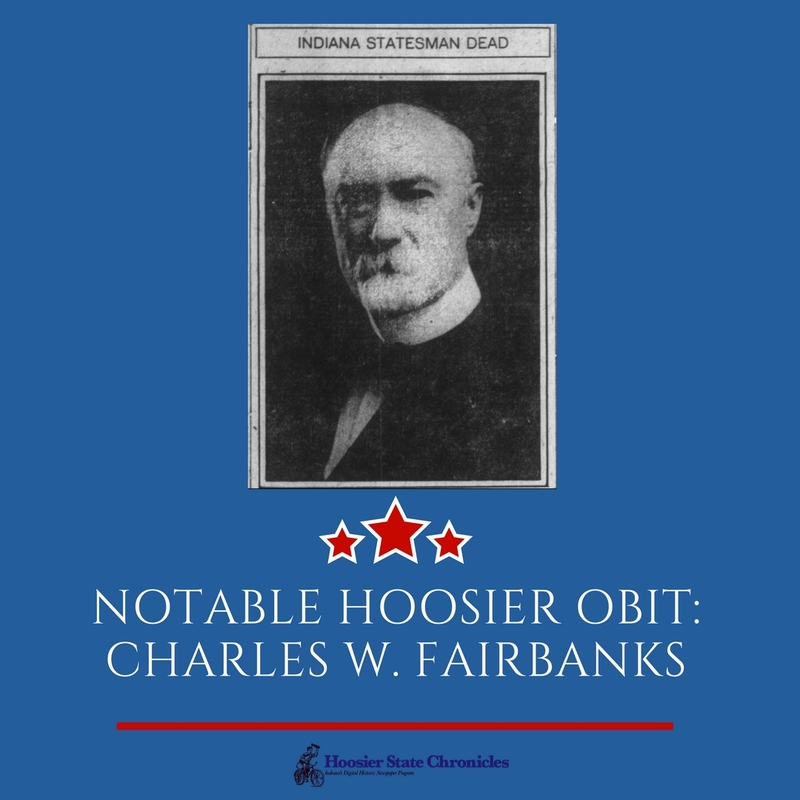 Frank McKinney “Kin” Hubbard, cartoonist for the Indianapolis News and creator of “Abe Martin,” delighted “millions of Americans” through his folksy-cartoons and down-home, Midwestern wit. 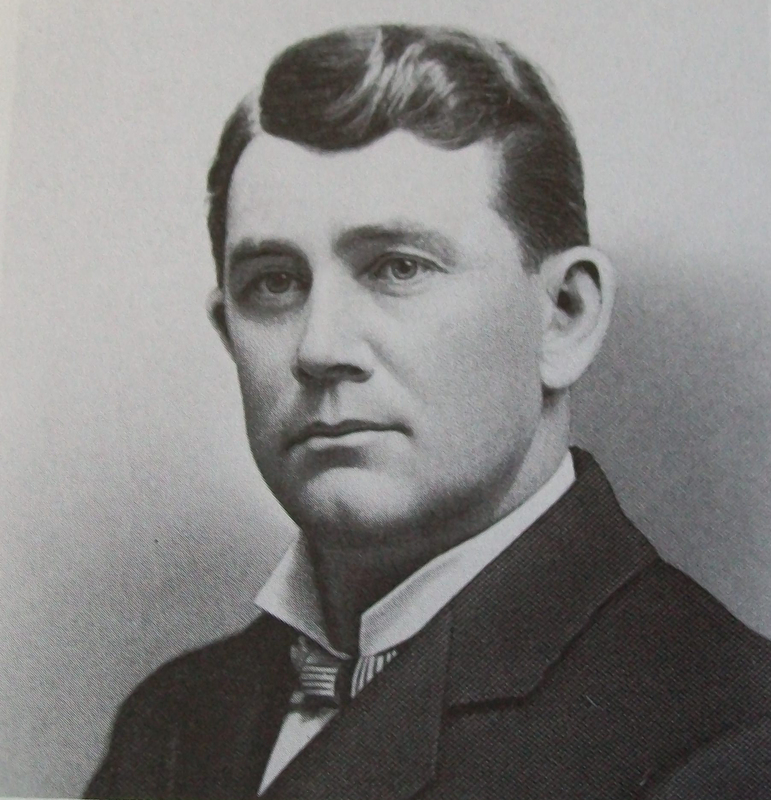 Abe Martin as a character represented the “nineteenth-century crackerbarrel figure traditionally focused on political involvement, rural residency, the fatherly image, employment, and success.” Hubbard developed the character during the 1904 Presidential Election and its success endured in the pages of the News until his death in 1930. 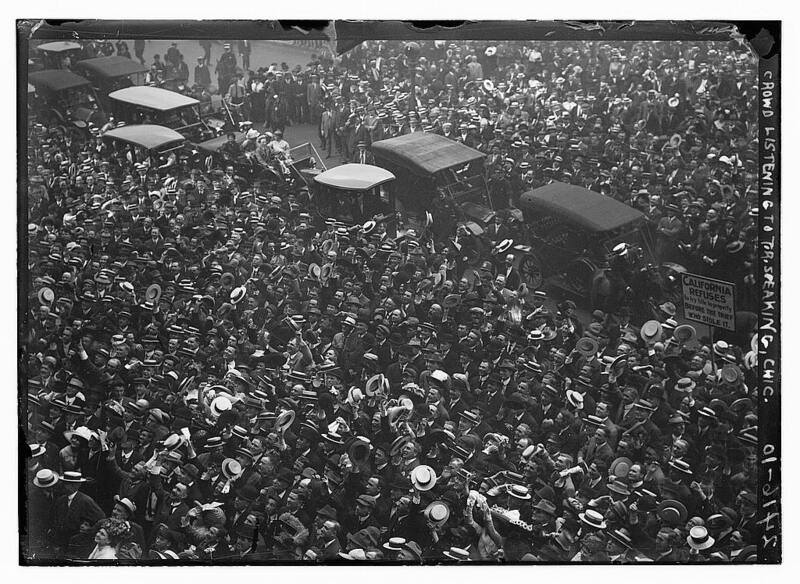 Always a political, yet down-home character, Abe Martin expressed his own “views” of key moments during World War I. In this blog, we will share with you some of Hubbard’s best Abe Martin cartoons during the war and how they represent the cartoonist’s own views of the conflict. 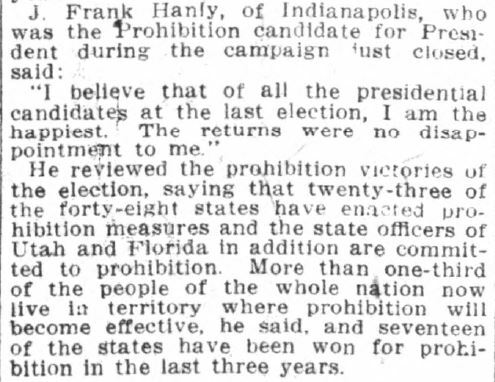 Indianapolis News, April 2, 1917. Hoosier State Chronicles. 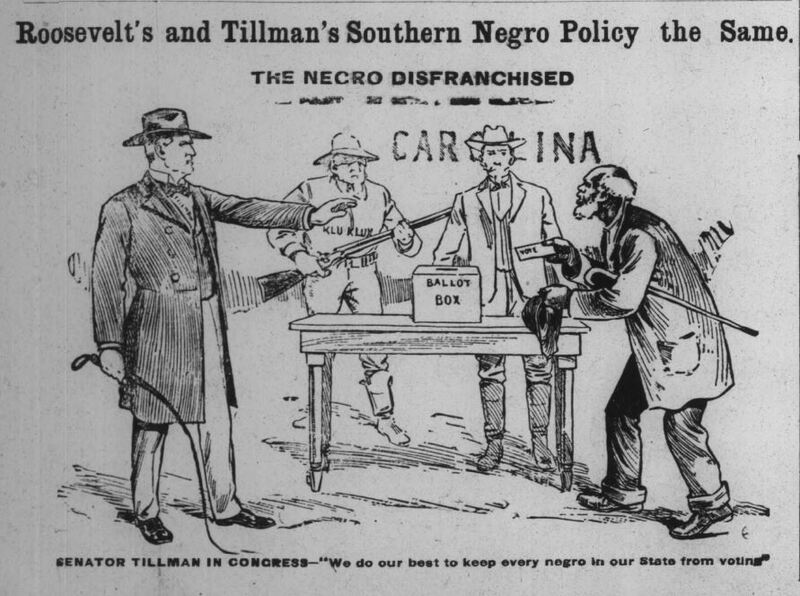 First, here is some historical context. 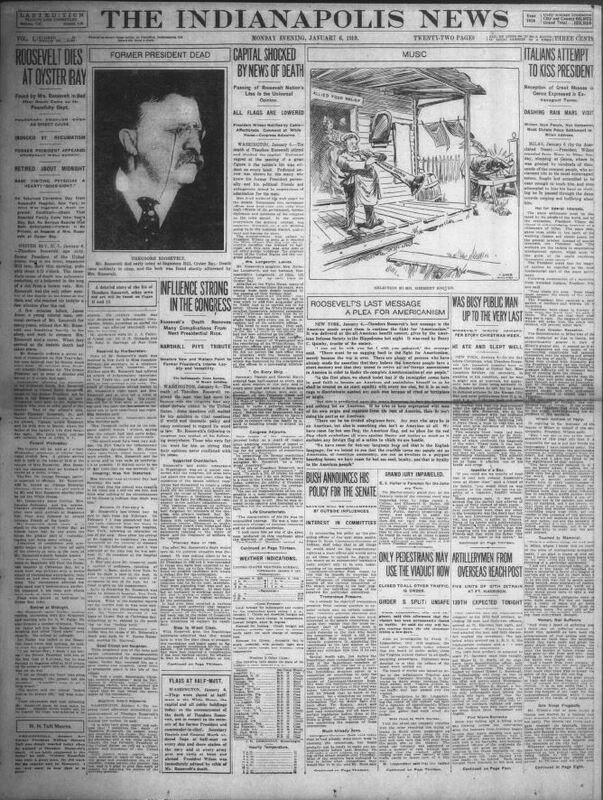 After the bombshell revelation of the Zimmerman Telegram on March 1, 1917, in which “German Foreign Minister Arthur Zimmermann promise[d] the return of Texas, New Mexico and Arizona to Mexico as reward for siding with Germany if the U.S. enters the war,” Americans increasingly became pro-war. Then, the breaking point occurred. Exactly a month later, a German U-boat torpedoed an American cargo ship, the S.S. Aztec, in British waters. 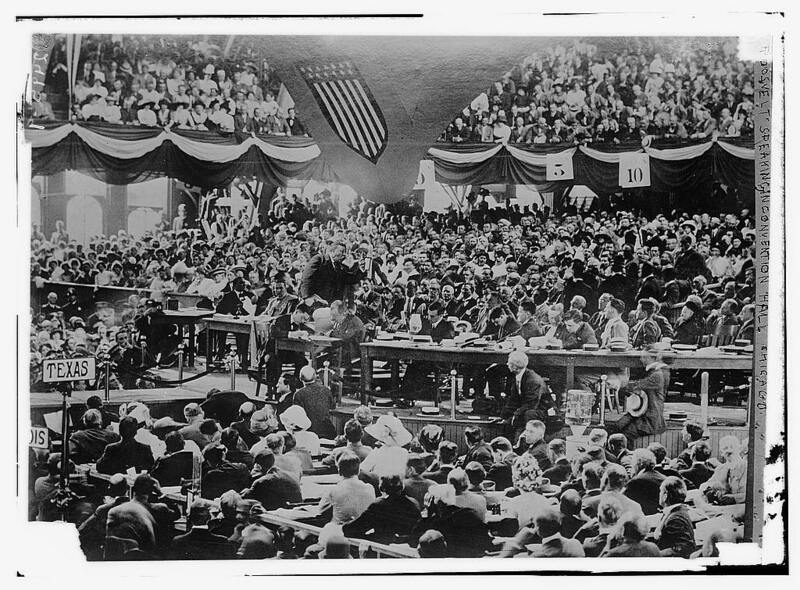 The next day, April 2, 1917, President Woodrow Wilson addressed a Joint Session of Congress, and called for action to make the world “safe for democracy” (we’ll come back to this phrase later). 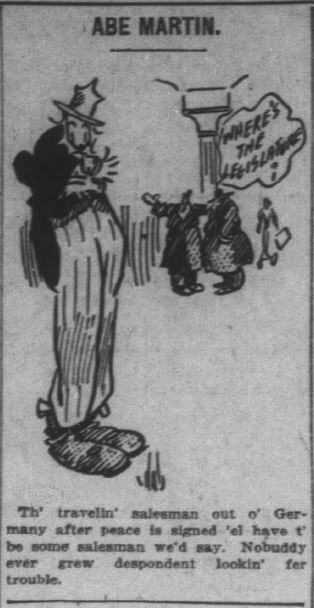 Wilson’s address likely inspired one of the earliest Abe Martin cartoons about America’s impending involvement in World War I. 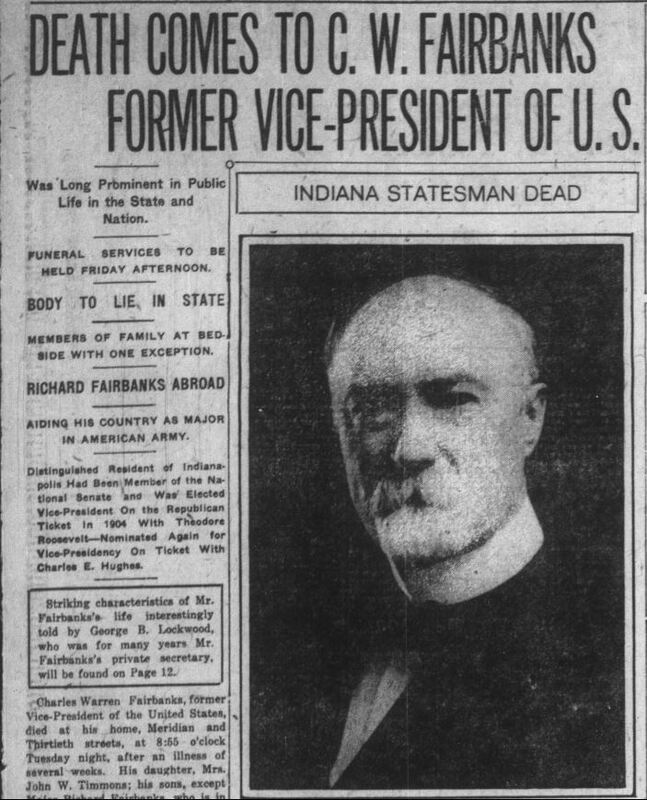 In the April 2, 1917 issue of the Indianapolis News, Hubbard’s Abe Martin quipped: “What’s become o’ the ole-fashioned patriotic citizen who used t’ say, ‘Well, I didn’t vote for him, but he’s my President jist th’ same’? Actions speak louder’n flags.” Hubbard, through Martin, is expressing an earnest, trusting patriotism that became a common theme for his cartoons during the war. 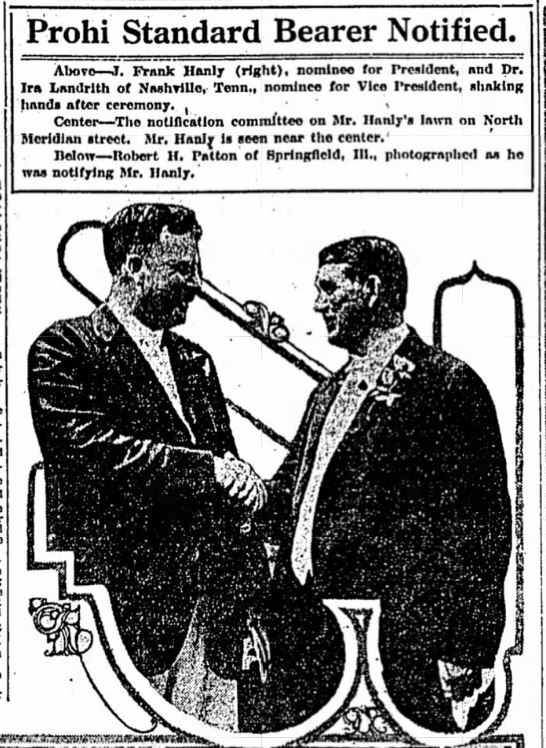 Indianapolis News, May 30, 1917. Hoosier State Chronicles. 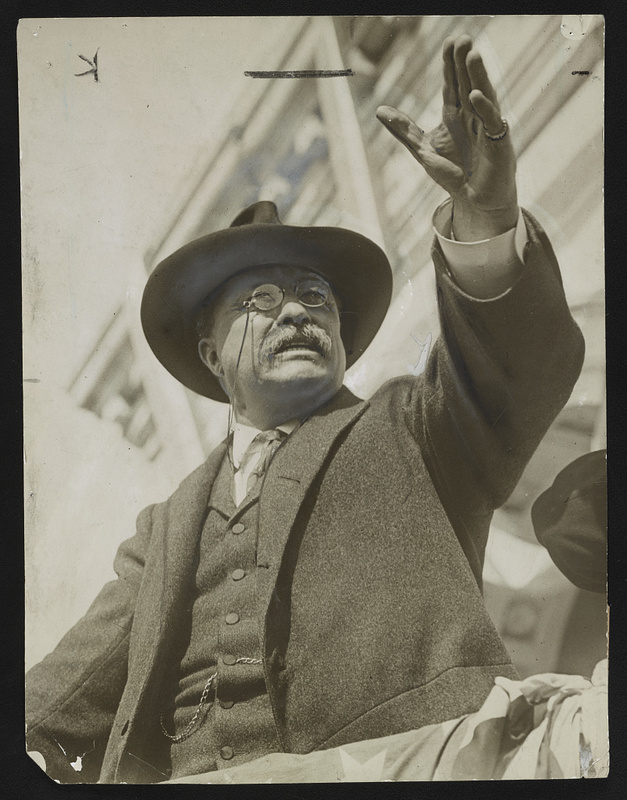 Congress declared war on Germany four days after Wilson’s address. 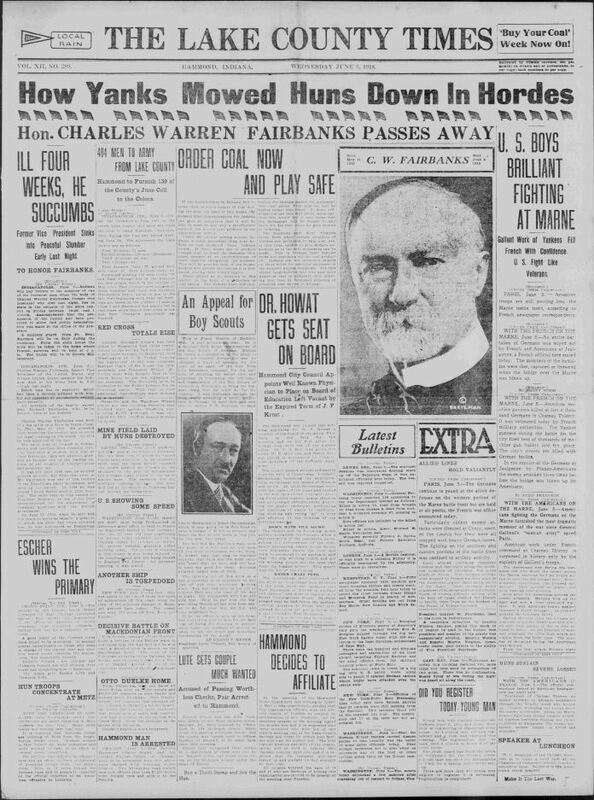 For the next two and half years, Hubbard’s Abe Martin routinely commented on the war and its influence on the home front. As an example, Hubbard promoted an essential war-time product in his columns, the Liberty Bond. 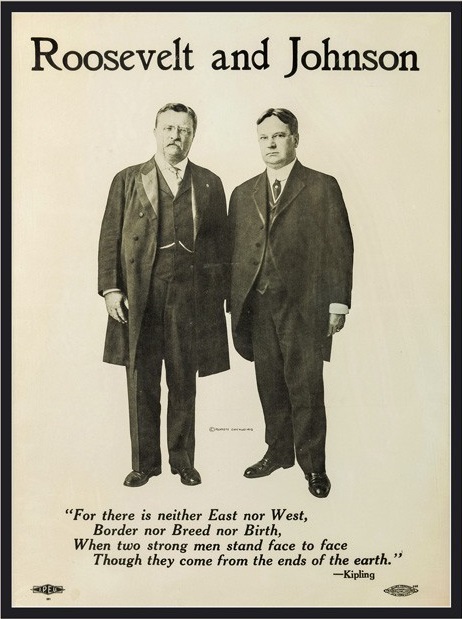 Liberty Bonds were the brainchild of William G. McAdoo, President Wilson’s Secretary of the Treasury, and facilitated a revenue stream for the federal government to finance the war. Within his cartoons, Hubbard encouraged purchasing Liberty Bonds and connected them to patriotism. In a cartoon from May 30, 1917, Hubbard opined that “Talkin’ big an’ flyin’ a flag from your radiator cap won’t keep an army goin’. 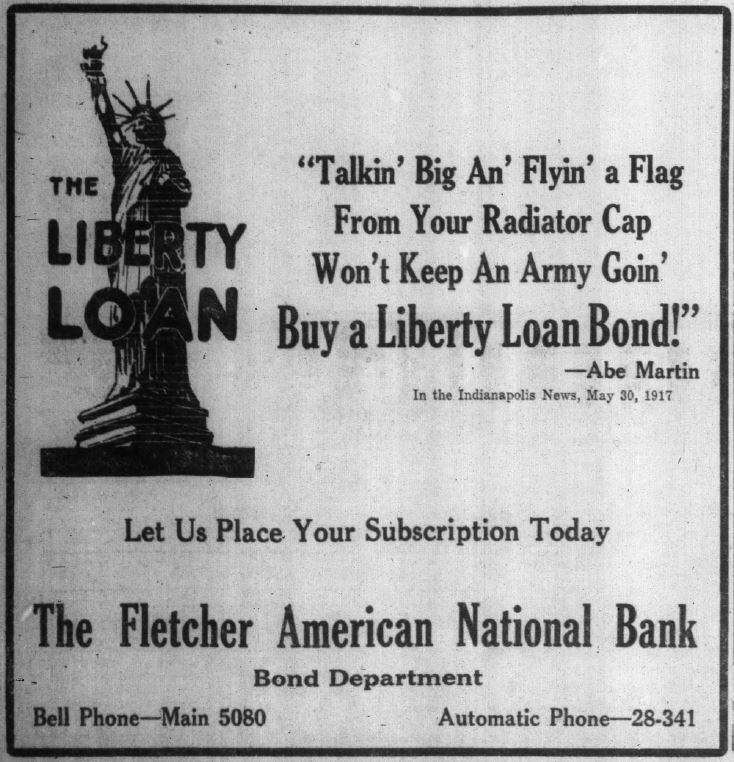 Buy a Liberty loan bond!” The very next day, the News ran an advertisement for Liberty Bonds, available for purchase from the Fletcher American National Bank, with Hubbard’s passionate call the day before. 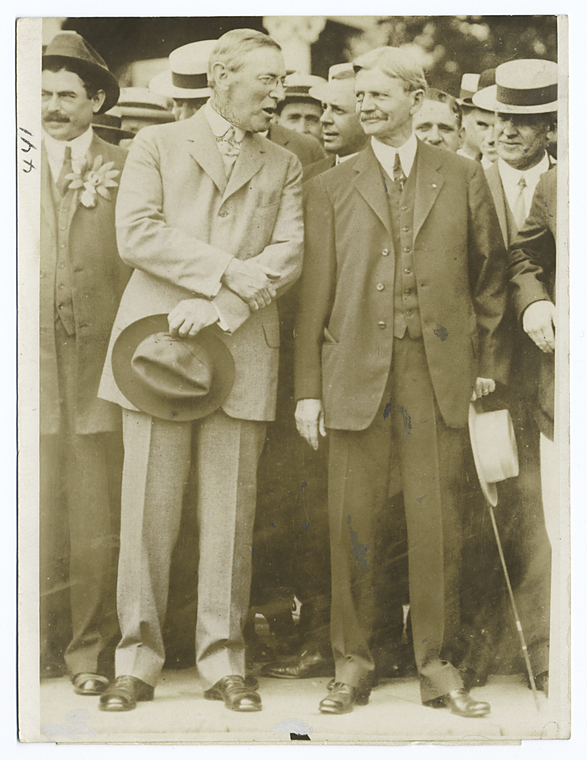 A year later, another mention of Liberty Bonds emerges in Hubbard’s column. “One o’ th’ best returns from a Liberty bond is an eased conscience,” declared the humorist through his down home alter-ego, Abe Martin. 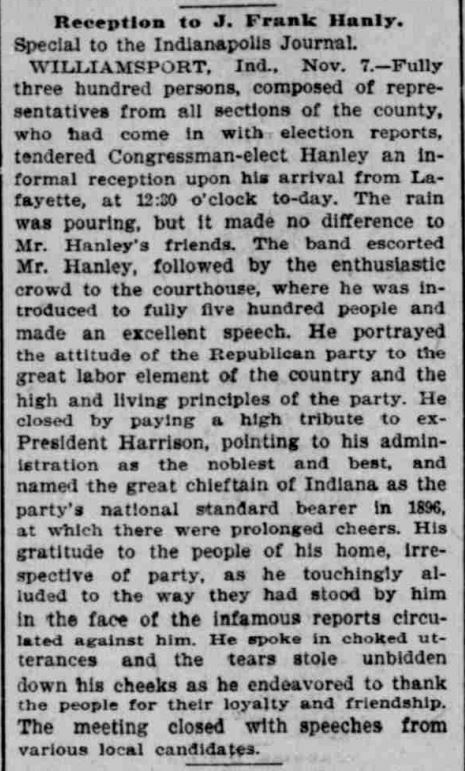 Indianapolis News, June 1, 1917. Hoosier State Chronicles. 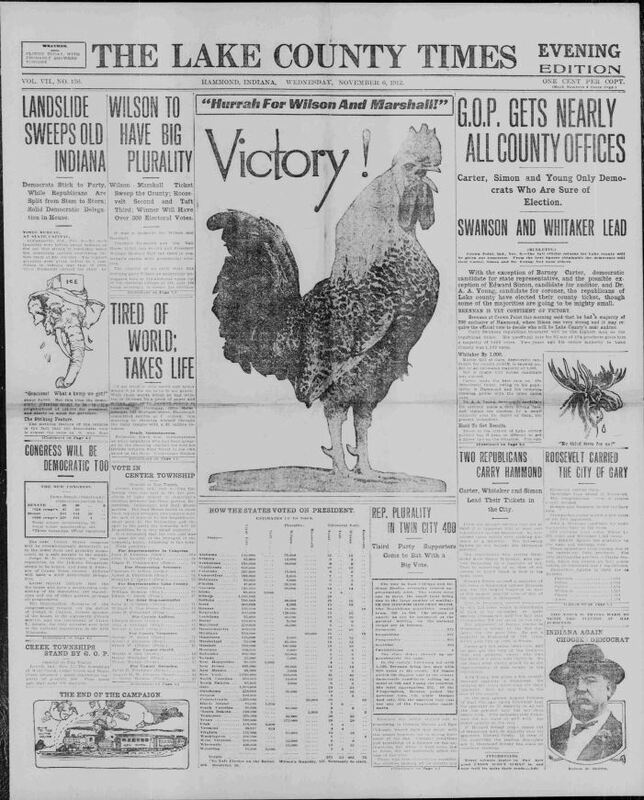 Indianapolis News, October 2, 1918. Hoosier State Chronicles. 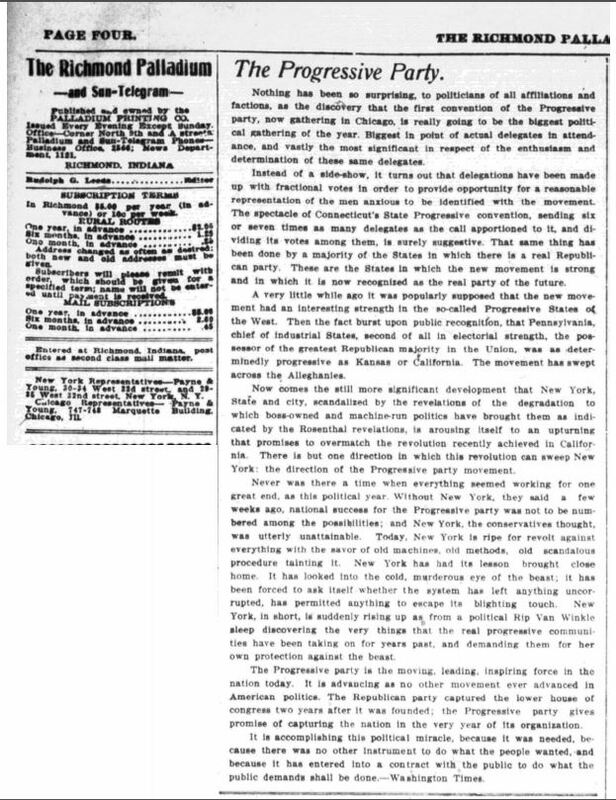 Another target for Hubbard’s criticism in defense of patriotism was the “tightwad,” or someone not willing to sacrifice for the war effort. In an October 22, 1917 piece, Hubbard declared that, “Th’ attitude o’ th’ tightwad briefly stated is this: ‘Why should I help win th’ war when I didn’ start it?” This notion had been articulated in two earlier cartoons but without the “tightwad” moniker. “It hain’t goin’ t’ help us win th’ war if you eat as much as a panther downtown while your wife skimps at home,” and, “Ever’ once in a while we meet a feller that’s too proud t’ beg an’ too honest t’steal, an’ too lazy t’ work,” Hubbard wrote. His belief on this was clear; war is costly and the sacrifice of a citizenry is essential for the success of its cause. Therefore, it is up to a citizenry to make the right choices during a time of conflict and not become a “tightwad,” as Hubbard termed it. 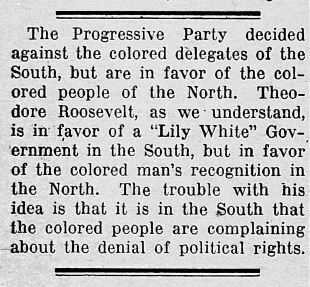 Indianapolis News, October 22, 1917. Hoosier State Chronicles. 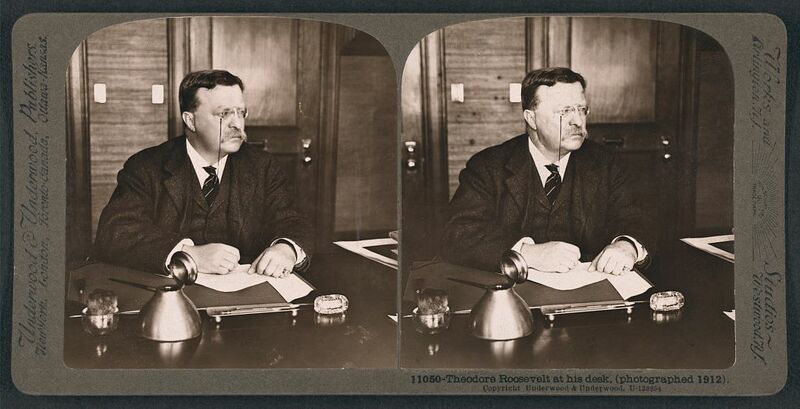 While liberty loans, patriotism, and sacrifice exemplified the home font, other developments were not as positive. 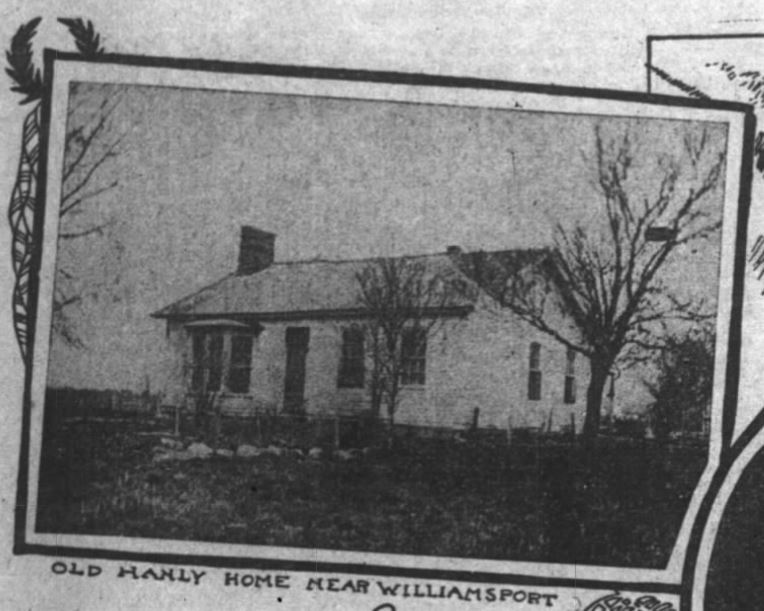 During the war, a growing cadre of teachers, legislators, and citizens advocated against the teaching of German in Indianapolis public school system. 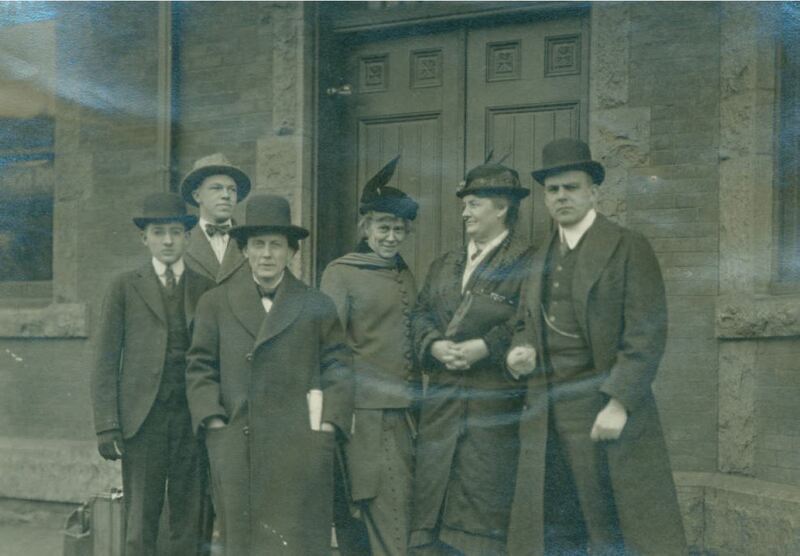 This movement sought to undermine the culture of the state’s substantial German-American community. Many Hoosiers viewed German-Americans as disloyal, unpatriotic, or anti-American because of their ancestry, and their continued use of the German language. 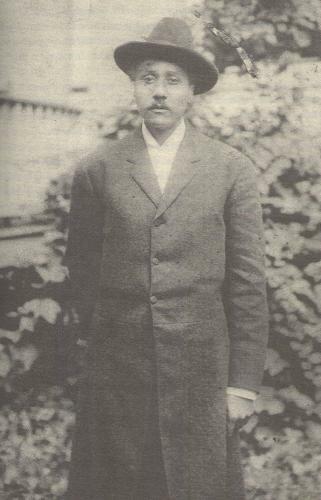 On May 3, 1918, Hubbard wryly commented on the situation via Abe Martin: “Now that they’ve taken German out o’ th’ schools let’s take Latin out of the seed catalogs,” mocking the taxonomic descriptions of plants. 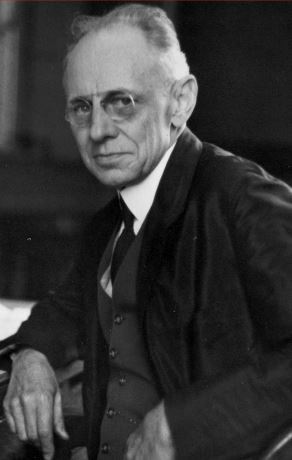 Despite his strong support for America during the war, Hubbard’s subtle critique of removing German language instruction from the schools showed his commitment to cultural diversity and his rejection the crass chauvinism of its opponents. For the benefit of . 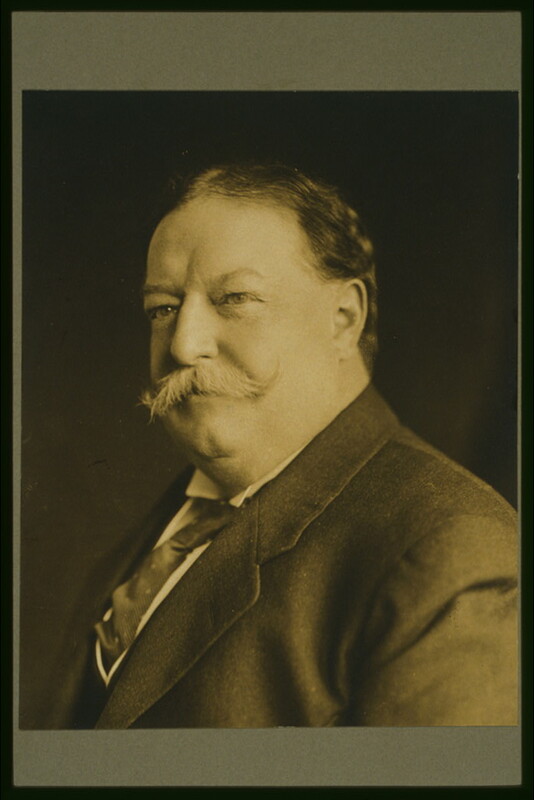 By 1919, despite Hubbard and others’ criticism, Indiana legislators (led by future Governor Warren McCray) crafted and passed legislation that eliminated the teaching of German in all Indiana schools. As a result, German language instruction, with a few exceptions, disappeared from Indiana’s schools. 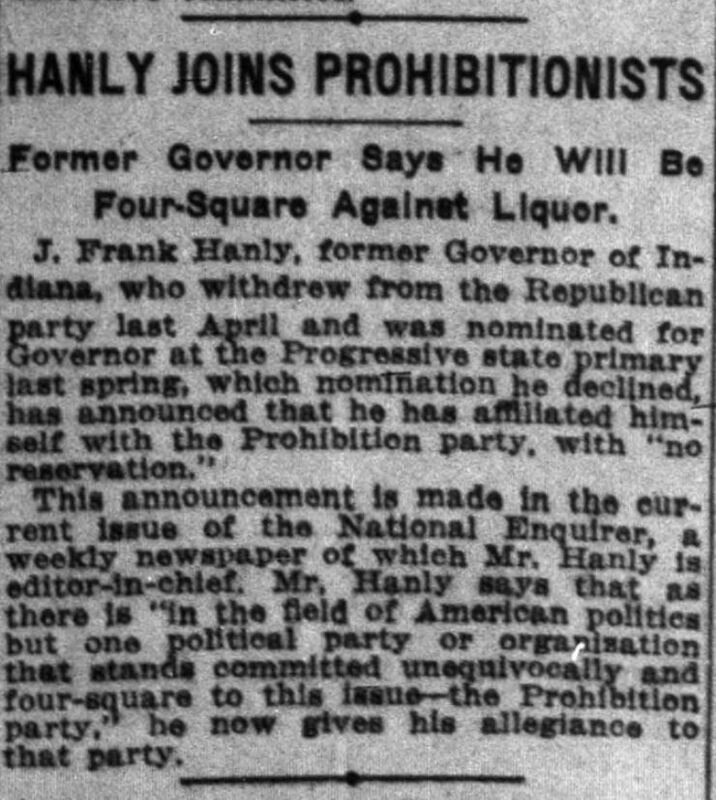 Indianapolis News, May 3, 1918. Hoosier State Chronicles. 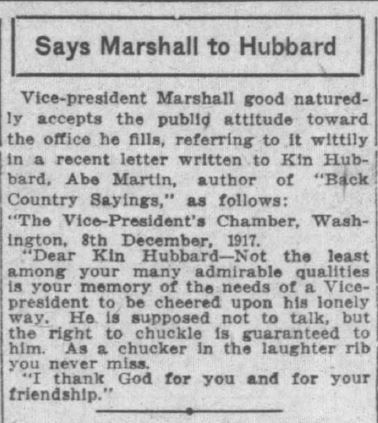 Dear Kin Hubbard—Not the least among your many admirable qualities is your memory of the needs of a Vice president [sic] to be cheered upon his lonely way. He is supposed not to talk, but the right chuckle is guaranteed to him. As a chucker in the laughter rib you never miss. I thank God for you and for your friendship. 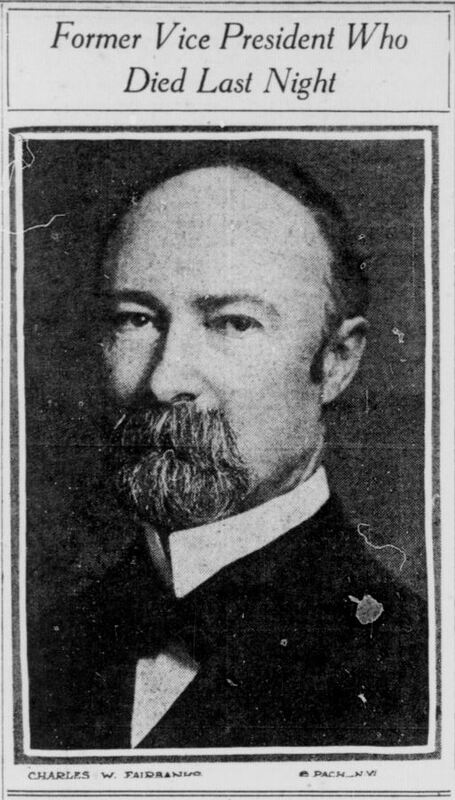 Indianapolis News, December 19, 1917. Hoosier State Chronicles. 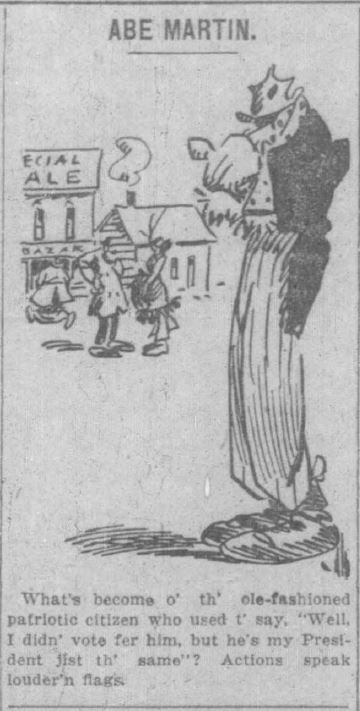 Indianapolis News, December 2, 1918. Hoosier State Chronicles. 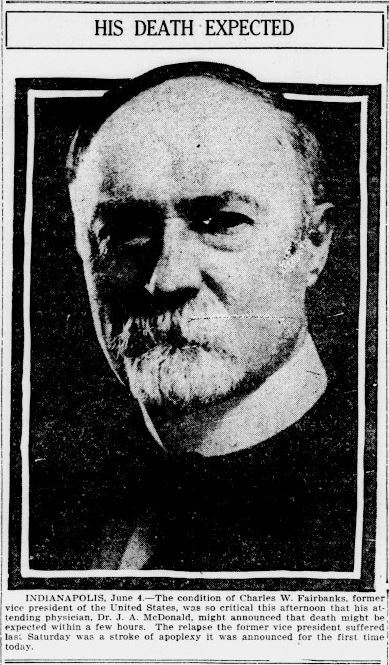 Indianapolis News, December 14, 1918. Hoosier State Chronicles. 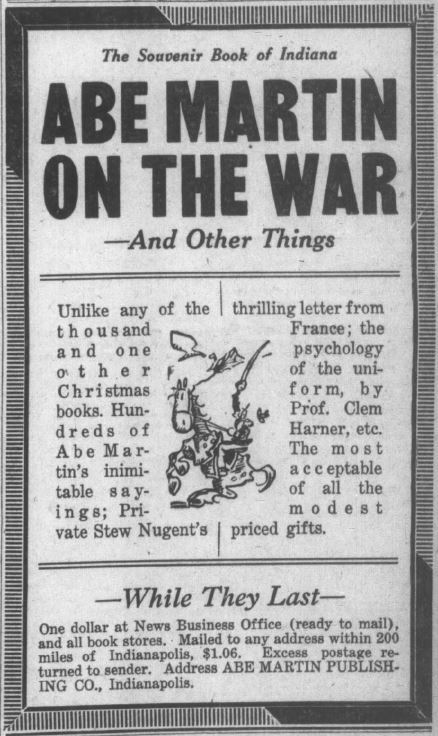 In the fall of 1918, Hubbard’s Abe Martin Publishing Company released a compendium of Abe Martin cartoons and musings under the title, On the War and Other Musings. Multiple ads for the book ran in the News, particularly during the holiday season. 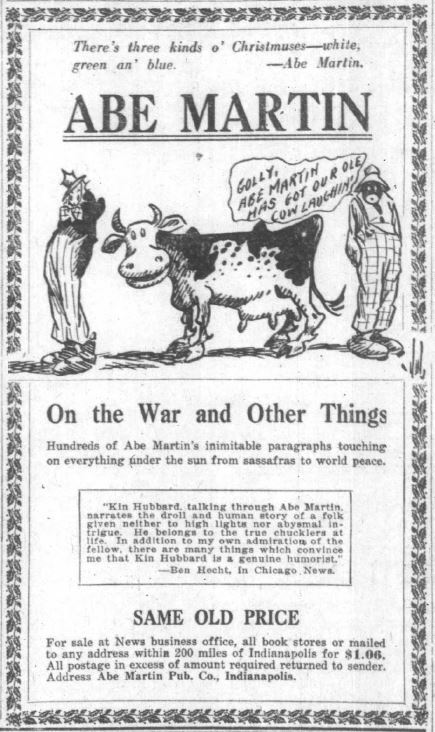 “Hundreds of Abe Martin’s inimitable paragraph’s touching on everything under the sun from sassafras to world peace,” read an ad from December 2, 1918. It was also fairly easy to purchase to book. 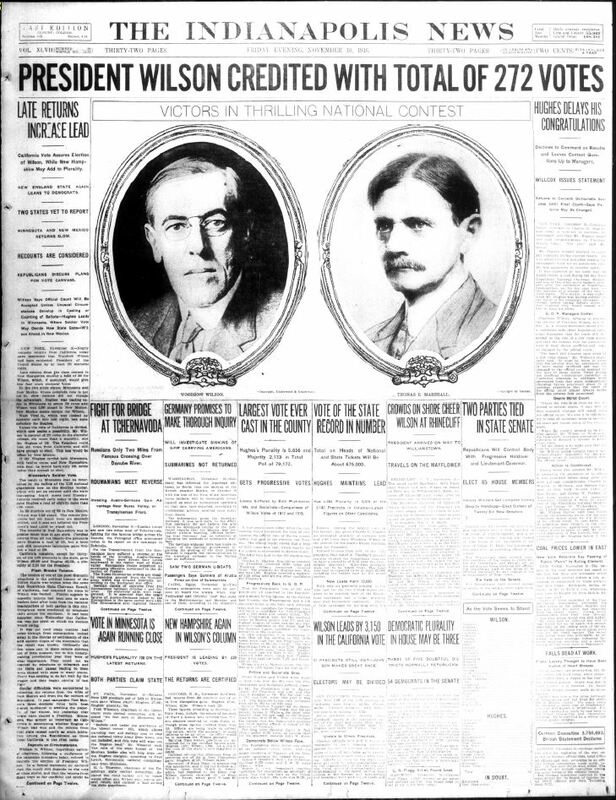 For the low price of $1.06 ($15.71 in today’s dollars), readers could have their copy shipped to them as long as they were within 200 miles of Indianapolis. It’d be “return to sender” if the postage was farther. 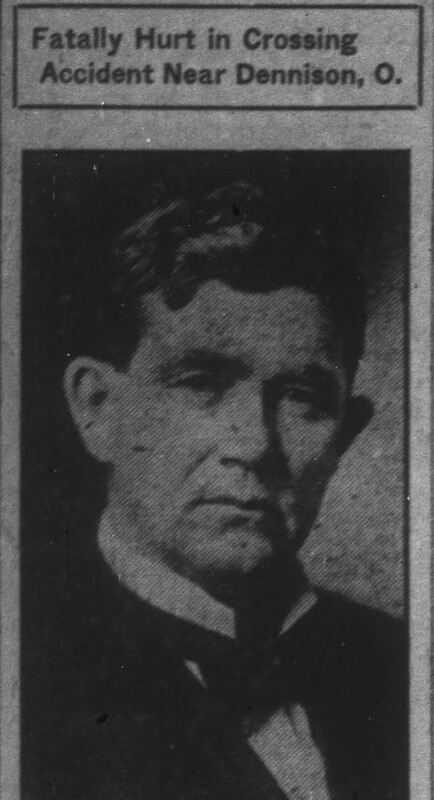 Indianapolis News, January 22, 1919. Hoosier State Chronicles. 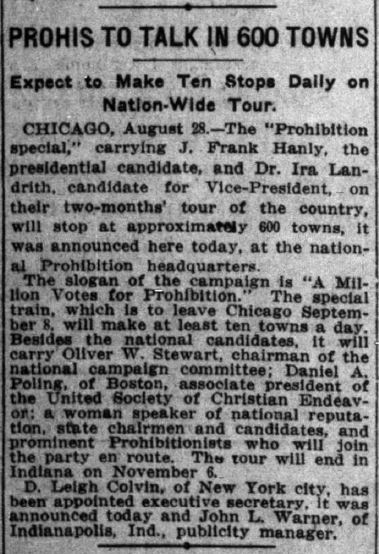 Indianapolis News, July 15, 1919. Hoosier State Chronicles. 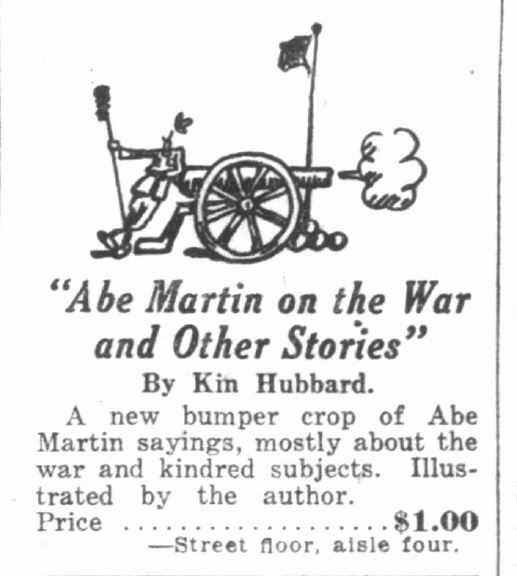 Kin Hubbard’s “Abe Martin” earned him the respect of his readers, political leaders, and the broader general public. His cartoons during World War I showed a commitment to his community, his country, and his craft. Hubbard, through Abe Martin, gave readers a Midwestern, “crackerbarrel” embodiment of the home front: rustic, altruistic, and patriotic. While certainly idealized, Hubbard’s art represented a commonplace, earnest notion of America during the war.